Set amongst lush tropical gardens and natural cenotes, Mahekal Beach Resort’s intimate and organic Mayan-inspired Revive Spa offers a one-of-a-kind cultural journey in the serenity of a comforting boutique spa experience. Enticing guests with customized treatments to sooth and balance one’s mind, body and spirit, the spa offers a menu of services inspired by the native culture and features Kinich products, a complete line of 100% organically intelligent, local home-grown products. 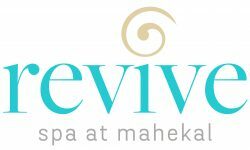 Built with inspiration from its rich, natural setting, Revive Spa is laid out in a round configuration imitating the philosophy of the Mayans. The spa itself encompasses 2,500 square feet of utter bliss: upon entering, spa-goers are instantly soothed into a state of relaxation with authentic ambiance and décor, the sound of soothing waters, and incredible service. Bohemian gypsy designs infused with colorful Mexican accents, antique wood furniture, subtle lighting, louvered windows and a palapa-style roof featuring a fiber optic ceiling, reminiscent of glowing stars, and the free-flowing feel throughout complete the well-appointed, yet indigenous style. Palapa-style treatment rooms intermingle amid lavish gardens and water features forming the new boutique spa. The two-indoor relaxation rooms welcome guests with freshly squeezed juice or champagne, aromatic scents and soothing music. The spa is also equipped with two intricately designed indoor rooms for massage treatments and men and women’s locker rooms. Additionally, there is a separate and completely private VIP therapy room, perfect for couples or private groups seeking un-plugged privacy and intimacy in an authentic, carefree atmosphere. This VIP therapy room boasts a dedicated bath area, an indoor and outdoor shower, a freestanding bathtub and private access to the artfully manicured Zen Garden. From traditional and tropical remedies, to the natural and luxurious spa treatments utilizing locally sourced organic ingredients, Revive Spa channels the Mayan culture and the wholesome ambiance throughout, giving guests a truly restorative spa experience while enjoying the serenity of nature in a Zen-like setting.